This is an article that was just published in West Coast Homes & Design. The top kitchen is extraordinary, the travertine a perfect backdrop, the shelf with oriental pottery a great focal point and I was so happy to be able to help you styling for the photoshoot. Fond memories of two exciting days. i do love a contemporary kitchen. Thanks so much for sharing your work, you always do fabulous job and your design work is what we should all aspire to create. This is a fabulous article and I hope that it brings you some great clients. You definitely deserve it. Great article, and terrific work, bravo. Thanks for posting such a good blog. Did you get listed online your business.YOu can do it for free by just adding it to the UK's best online business directory. How exciting! Nice look for a hurried world right now. Tranquil, peaceful, and modern. Congrats Patricia! How fresh and wonderful! Congrats on the article...love the use of stone on the walls. Gorgeous, really gorgeous! Congratulations Patricia! great article and stunning kitchen. Congratulations! You deserve it. 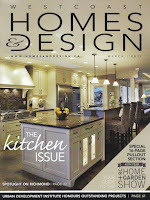 I liked the description of what the kitchen is (should) be today..
Congratulations on your article in West Coast Homes! Nice feature! The kitchens are great. I especially like the use of lighting. Congrats on getting an article in West Coast Homes & Design and great work on the rooms. wonderful! i love this home.Beautiful stone and walls.This is a fabulous article.